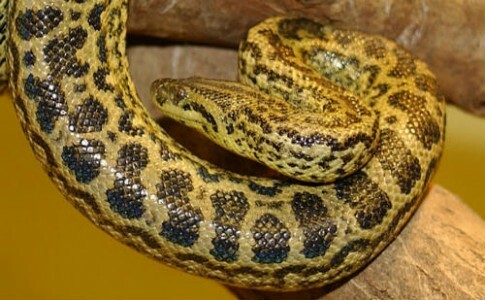 There are four different species of anaconda: Green, Bolivian, Yellow and Dark-Spotted Anacondas. The largest species is the Green Anaconda which can grow up to 30ft (9m) in length and weigh up to 550lbs (250kg)! They are part of the boa constrictor family. They are found in the Amazon Rainforest and usually inhabit marshes, swamps and slow moving streams. They do not lay eggs but actually give birth to live young. Female anacondas are significantly larger than males. Once they have reached their adult size Anacondas can take on wild pigs, caiman, capybara and even jaguars! Anacondas are not venomous and usually kill by constriction (wrapping around and squeezing their prey until they can no longer breath). Their jaws stretch so they can swallow their prey whole. After a large meal they do not need to eat for weeks.